Cooking Christmas dinner can be a stressful affair. If you want to cook the perfect Christmas dinner with all the trimmings, there’s one vital ingredient – planning. 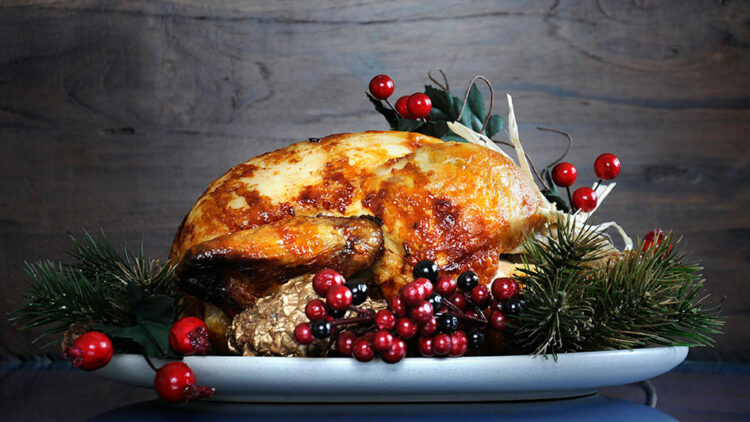 Chef Director, Pete Redman has prepared a handy Christmas dinner countdown time plan so that you can spend as much time with your friends and family on Christmas Day. Whatever time you are planning to eat, Pete has worked out exactly what needs to be done when. For extra convenience, you can download and print the christmas-dinner-countdown-timeplan. Make the cranberry sauce and Christmas pudding (if you haven’t already), cover and chill. Prepare the stuffing. Store one third in a covered bowl in the fridge; use the rest to make bacon-wrapped sausages and chill in a covered ovenproof dish. Make the sauce for the Christmas pudding; cover and chill. Make the black tea brine and cover the turkey as per recipe. Leave in the fridge till the morning. Prepare the turkey stock (if making your own). Allow to cool, cover and chill. Prepare and weigh ingredients for your Marmite bread sauce, if using. Peel and cut the potatoes and carrots; keep the potatoes covered in cold water and cover the carrots with a damp cloth, you do not want to soak the carrots as this will dilute their flavour. Cut your parsnips and store in a bowl using the same method as the carrots. Take anything you have prepared in advance out of the freezer and leave in the fridge to defrost. Chill the champagne, wine and water. Stuff the turkey, weigh and calculate cooking time (18 minutes per 450g/1lb). Preheat oven – fan 170C conventional 190C/gas 5. Put the turkey in the oven to roast. (Timing based on a 4.5kg/10lb bird, weighed after stuffing.) Cover with foil, check and baste every hour. Prepare red onions and squash. Cook the potatoes on the hob for around 8 minutes, be brave with this, the further they go the fluffier the final result. Drain and give them a shake- this will make them crispy later. Tip them into a large tray in one layer, and add the fat – olive oil, butter or goose fat – then season really well. Toss well, so they get completly covered in fat. Uncover the turkey. 15 minutes later, pour over thyme infused oil or baste with butter and fresh thyme leaves. Remove the turkey. Cover tightly with foil and leave to rest. Drain off resting juices and use to make bread sauce. Put red onions, squash, and stuffing rolls in the oven to roast. Reheat bread sauce, stirring occasionally and adding more liquid if you need to, you don’t want it too thick. Put your parsnips in the oven to roast. Put the Christmas pudding onto steam. Warm plates and serving dishes. If there is no room in the oven, place them in a sink of boiling water and dry them just before serving. Take the cranberry sauce from the fridge and allow to warm to room temperature, this will improve the flavour. Cook the carrots in as little water as possible so you retain their full flavour, fry or boil your sprouts. Make sure someone pours the cook a drink . . . Serve dinner, sit back and enjoy. I hope this Christmas lunch countdown time plan will leave you feeling relaxed and triumphant. Now all you have to do is work out what to cook with all those leftovers.